Punchbowl Park is (mostly) open for Business! Spring is a wonderful time to visit the new Punchbowl Falls County Park, located on the West Fork of the Hood River, near Dee. This article is offered an update on the new trails that area gradually being constructed in the park and a guide to visiting this beautiful area for a sneak preview while the trails are being completed. Punchbowl Falls Park was acquired from a private timber company by the Western Rivers Conservancy just a few years ago, and finally came into public ownership in 2015 when Hood River County received a state grant to transfer the land from the conservancy. Trailkeepers of Oregon (TKO) has since been busy constructing a new loop trail geared toward families and casual hikers looking for an easy stroll with a lot of scenery. In 2016, TKO volunteers completed most of the West Fork Trail, a scenic route that traverses the open bluffs above the Punchbowl Gorge before arriving at a spectacular cliff-top viewpoint above Punchbowl Falls. 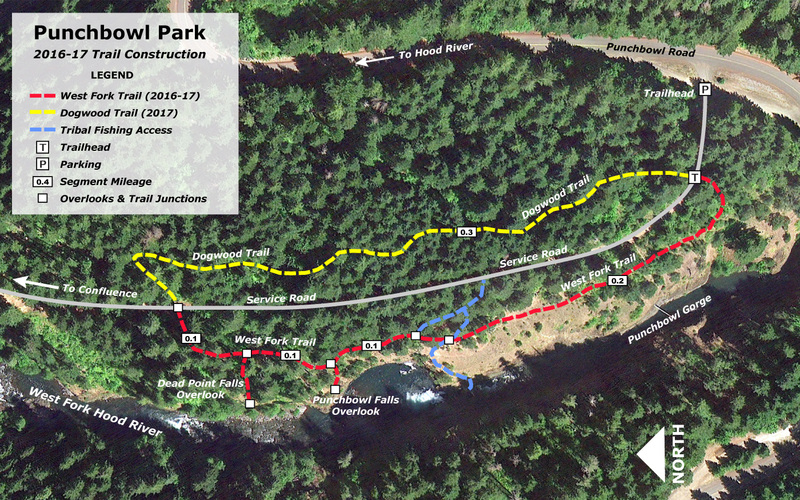 The remaining segment of the West Fork Trail is expected to be completed by early summer, and will include a short spur to a viewpoint of beautiful Dead Point Falls, where a boisterous Dead Point Creek cascades into the West Fork. Over the summer and fall, TKO also expects to complete the Dogwood Trail, a short forest hike that will create a loop back to the trailhead. The completed loop will be just 0.8 miles in length, making it ideal for families and casual hikers. While the West Fork portion features views and rugged terrain, the Dogwood Trail offers a quiet forest and vibrant fall colors from vine maple and dogwoods that thrive under the Douglas fir and Ponderosa pine canopy. You can hike most of the new West Fork Trail now. Just look for an obvious new path heading off to the left about 100 feet down the park service road from the gate at the trailhead. The new trail descends briefly through forest before providing the first of many views into the Punchbowl Gorge. As you travel this section, you’ll pass through several groves of gnarled Oregon White Oak that thrive along the rocky bluffs. Watch for the collapsing remains of an old stairwell making its way down the cliffs on the far side of the Gorge, too. These stairs were built in the 1950s, when the concrete fish ladder was constructed along the west side of the falls. While the ladder mars the natural beauty of the area, it does provide passage to extensive upstream fish habitat for salmon and steelhead. 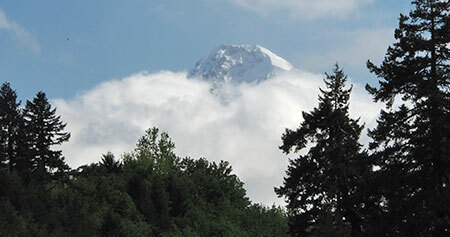 You will also pass a series of faint trails that cross the new hikers route. While these informal paths are often used by kayakers to portage the falls, they were originally travelled by tribal fishermen visiting the falls. 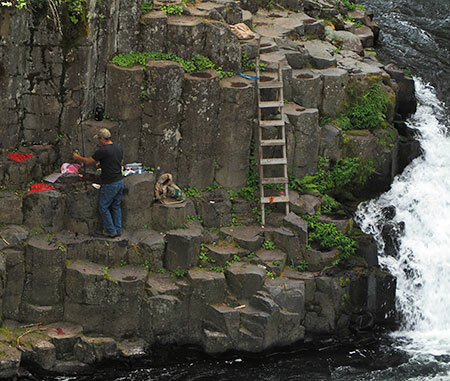 The area below the falls is still reserved for tribal fishing, and you may see local Native Americans fishing for salmon and steelhead from the cliffs inside the Punchbowl, just as their ancestors have for centuries. The new trail soon descends through more Oregon White Oak groves to the spectacular viewpoint of Punchbowl Falls. Plan to spend some time here watching the mesmerizing churn of the falls into the huge pool below. Keep an eye on kids and pets, here — there are no railings along the abrupt cliff edge. On clear days the viewpoint above Punchbowl Falls has an added surprise: Mount Hood rising in the distance, above the Punchbowl Gorge. From this viewpoint, you may also see tribal fishermen on the rocks below — while it is fine to watch them work from above, please be courteous. Hopefully, the ladder can someday be rebuilt in a way that restores some of the beauty of this spot, as it surely could not have been built in this manner under today’s environmental protections. This amazing place has deep significance to Native Americans, and it seems appropriate to undo some of the impacts of our modern age on a place so valued by the tribes. From the Punchbowl overlook, the route climbs back into forest for a few hundred yards. TKO crews are still completing the groomed tread, but the rough path is easy to follow. Watch for a faint side trail heading off to the left a few yards before the West Fork Trail ends at the service road. This spur path leads to a terrific view of Dead Point Falls, where Dead Point Creek cascades into the West Fork. Watch kids and pets here, too, as the viewpoint is unprotected. It’s easy to explore the northern section of Punchbowl Falls Park using the park service road and some of the fishing trails that crisscross the area. One of the most dramatic places to visit is the confluence of the West and East forks of the Hood River. To reach the confluence, turn left on the service road from the end of the West Fork Trail and follow it to an obvious turnaround, where the road makes a sharp turn to the right, around the nose of a ridge. Look for a fisherman’s path on the left, heading steeply downhill hill to the confluence. The two rivers area study in contrasts. The East Fork is unruly and filled with glacial till, and has built a huge pile of cobbles were it meets the West Fork at the confluence. The West Fork is cold and clear, with a large eddy that makes for good fishing and safe place for kids to wade in summer. Spring and fall are the best times to visit Punchbowl Falls Park. In spring the waterfalls are at their best, and there are wildflowers blooming throughout the park. In fall, the park lights up with autumn colors that only the east side forests can offer. Both seasons are quiet compared to the summer months, when the park can be quite busy with swimmers and floaters on weekends. Wildflowers at the park are a unique blend of east and west. In April, the bluffs above Punchbowl Gorge are blanketed with Grass Widow (above), a desert flower common in the Columbia Gorge east of Rowena. The same meadows of grass widow are shared by Larkspur (below), more common in the wet west end of the Gorge. In forested areas, you’re likely to see Trillium (below), a hallmark of the rainforests of the western Gorge, and in early spring you’ll find Glacier Lily (below) where the trail passes through Oregon White Oak groves. Watch closely and you might spot Calypso Orchid (below). This is another native more common in the wet forests of the west Gorge, but makes its home in the transitional forests of Punchbowl Falls Park. In autumn, Pacific Dogwood (below) brings brilliant color to the forest understory throughout the park. In western Oregon, dogwood generally fade to pale yellow or pink in the fall, but on the east side of the Cascades, these graceful trees take on brilliant shades of coral, crimson and burgundy. In spring, Pacific Dogwood also blooms with handsome white flowers. When completed, the new Dogwood Trail will pass through several groves of these beautiful trees. Vine Maple is everywhere in the forests of Punchbowl Falls Park, and like the native dogwood, these graceful trees light up in autumn, providing shades of crimson, orange and bright yellow. Vine Maple crowd the route of the new Dogwood Trail, and will combine with the dogwoods to make this an exceptionally beautiful autumn hike. Fall colors in Punchbowl Park peak in mid-October and spring wildflowers are at their best from mid-April through early June. If you still have time after visiting the West Fork Trail and the confluence, once last corner of Punchbowl Falls Park you might want to explore is the dizzying view from the bridge located just beyond the trailhead parking area. Simply walk about 200 yards to the soaring bridge for a spectacular look into Punchbowl Gorge, but use care — the railings are uncomfortably low! The view upstream from the bridge encompasses the West Fork roaring into the narrow mouth of the Gorge, framed by towering walls of columnar basalt. The small structure just upstream is a river gauge used to monitor stream flows on the West Fork. The view downstream from the bridge peers into the narrows section of the gorge, with the West fork carving stunning curves and pools into the basalt walls. These scenes, and the massive basalt amphitheater of Punchbowl Falls area among the best Columbia River basalt formations found anywhere in the region. It’s mind-boggling that this spectacular canyon was in the hands of a private timber company for more than a century! Thankfully, it is now protected in perpetuity as a nature park. Much work lies ahead for Punchbowl Falls Park this year. TKO has several volunteer work parties planned (you can learn more about them here), and Hood River County will begin improving the parking area at the trailhead to be a more accessible. By fall of 2017, the new Dogwood Trail should be completed, and TKO volunteers will install trail signs on both the West Fork and Dogwood trails, officially opening the new loop to visitors. Over the long term, Hood River County and TKO are also planning an extension of the West Fork trail to the confluence and other trails in the new park. Where to Find Punchbowl Falls Park? It’s easy to get to the new park! From Hood River, take 12th Avenue south where it soon becomes Tucker Road (aka Route 281). Follow Tucker Road and signs pointing to Lost Lake. After crossing the Hood River at Tucker Bridge, watch for the Dee Highway immediately veering off to the right. Follow Dee Highway (also part of Route 281) to the rusty, dusty remains of the old mill town of Dee. Veer right again, crossing railroad tracks and then the East Fork Hood River, then turn right again onto Punchbowl Road just beyond the bridge. Stay straight on Punchbowl Road at a 3-way junction, then enter forest at a hairpin turn. Watch for the parking area on the right, just short of the high bridge over the West Fork Hood River. The new trail begins just beyond the metal gate that marks the park service road. Comments: Comments Off on Punchbowl Park is (mostly) open for Business! A few weeks ago I had the pleasure of meeting Zack Frank, the young photojournalist behind Undiscovered America, his project to photograph 56 places across the country that should become the next generation of national parks — Mount Hood and the Columbia River Gorge among them! With this ambitious project, he hopes to contribute to a new vision for the next 150 years of conservation in America. 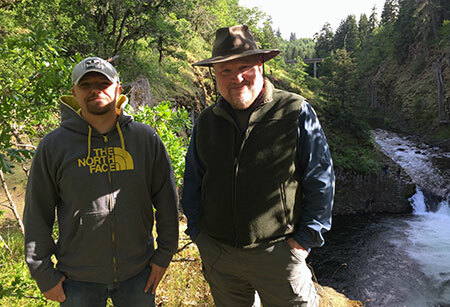 We met at Punchbowl Falls on the West Fork Hood River, a fitting spot for a conversation about overlooked gems that could stand next to the nation’s best-known national parks with a little vision and restoration. 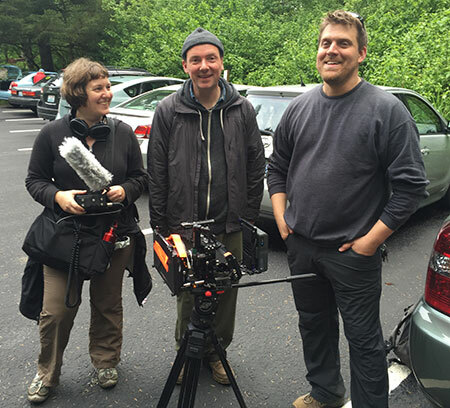 Our meeting was made possible by local filmmaker Christopher Alley, whose Ampersand Productions is currently filming a documentary dedicated to the new national parks movement, and featuring the Mount Hood National Park Campaign, in particular. 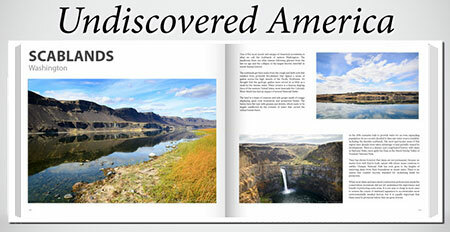 Zack came to the Undiscovered America idea from seeds sown in his youth, when his family drove from Pennsylvania to the great parks of the northern Rockies, including Yellowstone. These early experiences helped shape Zack’s refreshingly holistic vision for the national parks that would focus on restoring gems like Mount Hood and the Columbia Gorge as unique ecosystems that are not represented in the national park system today. His 6-month grand tour of future parks is funded through a successful Kickstarter campaign that drew nearly 300 backers and set a record for nature photography projects. 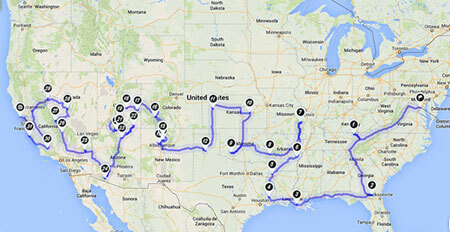 Zack will be the first known photographer to visit the 50+ sites proposed for national park status. Once his tour is complete, Zack will release a 200-page Undiscovered America book documenting his journey, and hopefully rallying a new parks movement in the same way that earlier photographers brought places like Yellowstone, Yosemite, the Redwoods and North Cascades to the public conscience for the first time. Images from his trek will also be displayed as a traveling show in art galleries across the country, further helping to spread his vision for a new era of national parks. Though Mount Hood and the Gorge are part of Zack’s tour, they are different in that they are anything but “undiscovered”! Yet, they do fit perfectly the larger frame of bringing more enlightened and sustainable land management to these special places under the unique stewardship of the National Park Service. Zack brings his experience as a photojournalist in the United States Marine Corp to the project. After meeting with him, it was clear that also he also brings a remarkable degree of wisdom, confidence and determination to the project that are beyond his years, a reflection of his time spent in Iraq during his service to our country. We’re also very fortunate that Zack has chosen to continue his service to the country in the form of his Undiscovered America project. Hearing about his vision for the next wave in the American conservation movement was a breath of fresh air. Too many in the old guard of the movement have become prisoners of playing defense, a necessary posture during an era of intense attack on the environment, for sure, but now suddenly out of touch with a new generation of Americans looking for a more compelling and sweeping new vision. Zack’s project avoids that the fear tactics and hot-button issues approach to conservation that no longer resonates with younger people, who instead are responding more to messages of hope, new ideas and opportunities to work collaboratively for broader solutions than the false choice of “wilderness-or-nothing”. National parks offer a great fit for this generation. 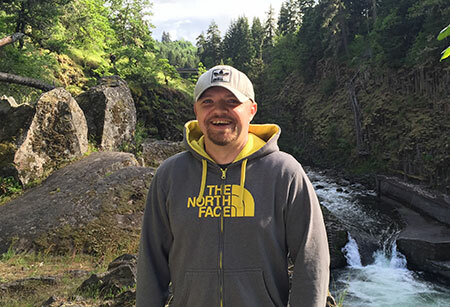 Zack says that he marches to the drum of the likes of John Muir, Timothy O’ Sullivan and Ansel Adams, and embraces the same sweeping vision that caught the imagination of the American mainstream and helped build the National Park System we treasure today. Most importantly, he thinks in increments of decades and centuries — not just the next election campaign or fundraising cycle. In that way, he is true to the pioneering conservationists he holds as his inspiration. I challenged Zack with a series of defeatist arguments I have heard against protecting Mount Hood and the Gorge as a national park — all too often from some of Oregon’s conservation leaders: how can an area with ski resorts, major highways, utility corridors and cut-over forest lands even be considered for national park status? One by one, he knocked these arguments down with real examples of existing parks where these supposed deal-killing obstacles like these are managed within a park context, in concert with a broader conservation philosophy that still ensures a sustained natural legacy. Zack Frank doesn’t see himself as a standard bearer, simply part of an emerging coalition. But what I saw in Zack is the face of a new generation of conservation leaders — whether he knows it, or not — who are unencumbered by false dichotomies and narrow orthodoxy that have too often muted the conservation movement. He is solidly a millennial, and like so many of his generation that I encounter, Zack gives me a renewed energy and sense of optimism that we can once again do great things on the conservation front, and starting with a new national parks movement! During our visit on the high cliffs above Punchbowl Falls, we watched as a group of tribal fisherman worked the massive pool below the falls for spring Chinook. 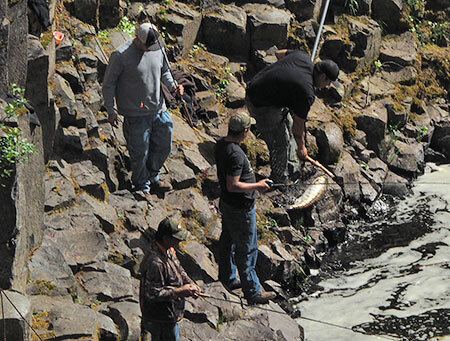 As they went about their tasks, it struck me that these men were fishing in the footsteps of generations of ancestors who had harvested salmon at this spot for millennia — and that that the stakes are very high for the Mount Hood region, right now. For centuries, the abundant ecosystems of Mount Hood and the Gorge have supported a large Native American population with a natural bounty that only now is at risk, thanks to just a few decades of rapid development and over-harvesting of resources. In this context, the broader frame that Zack Frank raises for Mount Hood the Gorge is this: we’re just passing through, so what will we choose to leave behind for future generations? While the ecosystems in the Mount Hood region have so far been resilient in the face of these new pressures (the forests have continued to recover after repeated harvesting, salmon return to ancient habitat when we reopen once-damned streams like the West Fork), we are now facing an unprecedented onset of global climate change. Will the sprawling maze of new clear cuts that now mar the upper West Fork valley recover, once again? Probably. But for the first time in millennia, we don’t really know for sure, and so our margin of error grows narrower in just how far we can push the ecosystem to meet our needs. On our walk to Punchbowl Falls, Zack and I talked about some of the answers that were all around us. Restoring Mount Hood means thinning plantation thickets, where industry efforts to short-circuit the natural reforestation cycle on clear cuts has left dangerously crowded stands of unhealthy, fire-prone trees. One such thinning project was underway at the Punchbowl site, where the Western Rivers Conservancy has carefully removed several insect-compromised trees from the forest. The Punchbowl property, itself, provides another answer: private land trusts working with local communities and governments to restore and bring into public ownership the most important sites and habitats. This continues to be the winning formula for Mount Hood and the Gorge, with much work to be done — and still a need for a larger national park vision to guide often fragmented efforts. Like most of the sites on Zack’s tour, the broader vision for Mount Hood and the Gorge will require a creative blend of acquisition, restoration and new partnerships. As I finished my interview with Zack Frank, the tribal fisherman below us were packing up their harvest for the day — a string of salmon that would soon provide food for their families or perhaps be sold in one of the familiar roadside fish stands. As we watched them scale the cliffs above the falls with their catch, the crest of Mount Hood — Wy’East — suddenly emerged from the clouds, brilliant with a fresh dusting of snow. Zack had spent the morning on the mountain, socked in by a lingering Pacific front, so it was his first sighting of the mountain on this leg of his trek. The scene unfolding at that moment could not have made a better case for why Mount Hood and the Gorge deserve better: the raw beauty, the amazing collection of ecosystems, from rain forest, fire forests and oak savannah to alpine and desert ecosystems; and perhaps most unique to the area, the rich, unparalleled human history. It was all right there in front of us, and I was thrilled that it could be part of Zack’s journey! Zack’s current project was successfully funded through his Kickstarter campaign, but you can still support him by visiting his website and ordering a copy of his forthcoming Undiscovered America book. You can also be a friend of the national parks. Zack recommends the National Parks Conservation Association (and be sure to let the know you support new parks! ), but I would suggest an even broader offering: an open mind to what might be, and a willingness to help a new generation of leaders realize their bold aspirations — including a new national parks movement!